Even after the death of a person, their ideas live on, Lithuanian Minister of Foreign Affairs Linas Linkevičius said during the funeral of one of Russia's opposition leaders, Boris Nemtsov, in Moscow on Tuesday. "The last time we spoke with Boris was last year in Vilnius, and I was surprised how much joy of life he had. He was never short of words. He knew a lot and believed in Russia. I remember and you probably remember one of his interviews more than 20 years ago when he was an active promising young politician in Nizhniy Novgorod. He said: 'Reforms are irreversible in Russia, unless you start shooting.' You can kill a person but you cannot kill freedom, truth, which he valued, and you cannot kill courage," Linkevičius said, addressing Nemtsov's mother, family members and other participants of the funeral. He told BNS on the phone from Moscow that Nemtsov's supporters were not intimidated. Linkevičius is accompanied by MEP Petras Auštrevičius, Emanuelis Zingeris, a member of the Lithuanian parliamentary Committee on Foreign Affairs, and Lithuanian Ambassador to Russia Remigijus Motuzas. Speaking on behalf of EU members states, EU Ambassador to Russia Vygaudas Ušackas said those responsible for Nemtsov's death must be found and brought to justice. He also expressed hope that Nemtsov's ideas and unfinished work would be continued. "The truth Nemtsov fought for was often far from being convenient. But he fought for it honestly and passionately, believing that there was no future without the truth. His convictions, principles and courage inspired us all and gave us hope. Boris embodied and defended those values we all cherish – respect for human dignity, democracy, belief in the power of civil society and the need for government accountability. He believed in an open Russia. Boris was a true political rarity. A personality of a grand scale," Ušackas said. Crowds of people are flocking to pay the last respect to Nemtsov to the Andrei Sakharov Human Rights Center in Moscow on Tuesday. A public ceremony of paying last respects to Nemtsov is taking place at Moscow's Andrei Sakharov rights Center. Nemtsov's family, including his mother and children, are standing in front of the casket. A wreath from the Russian president has been delivered to Sakharov Centre. Russian Prime Minister Dmitry Medvedev's spokesperson said the government was represented by Deputy Prime Minister Sergey Prikhodko. US Ambassador to Russia John Tefft is also attending the visitation. After attending the visitation services, the head of Rosatom state nuclear energy corporation, Sergei Kiriyenko, said he hoped "the law enforcement agencies will manage to quickly establish, at minimum, the perpetrators and contractors of that political murder". Russian opposition activist Alexei Navalny had asked the court to suspend his house arrest for one day to attend the ceremony but was denied. Nemtsov, co-chair of RPR-Parnas and deputy of the Yaroslavl regional duma, was killed as he was crossing Moskvoretsky Bridge in view of the Kremlin late on Friday night. 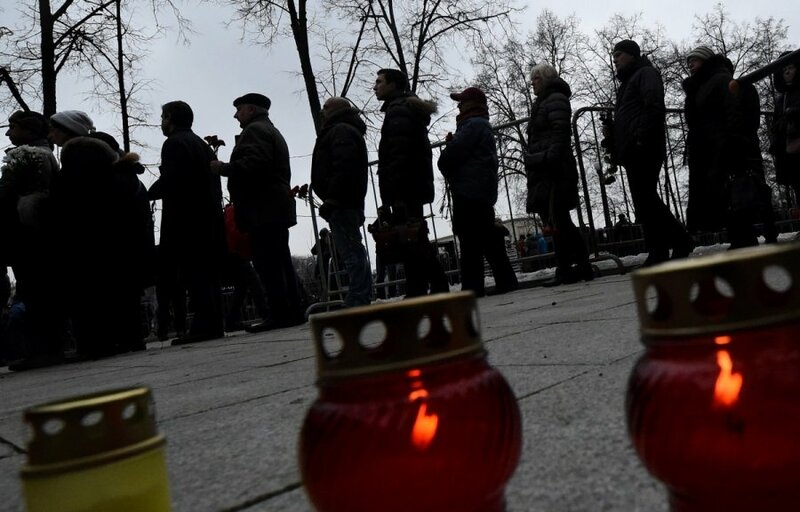 The funeral for the opposition politician will take place later on Tuesday at Moscow's Troyekurovskoye cemetery. This is probably the most difficult piece in my life.